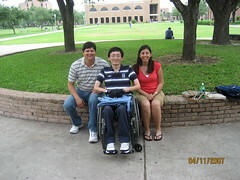 Got an email from my cousin who is presently teaching in University of Texas - Pan American. He just moved there from Michigan after successfully earning his PHD. Anyway, Everton (nickname) just moved over to the southern tip of Texas and is happily settling down. Gone are the days of frost-biting bitter weather in the north. In the email, he talked about the local students situation here and seeing how many of you readers of this blog are also juggling working and studying. I hope this would be some kind of inspiration to you. Working and studying is never an easy combination but many chose to take this path mostly for financial reasons. I salute those who still have the drive to further their education. I place the pursuit of education in very high regards, so much so that I am helping quite a number of students even as we speak, both financially and otherwise. Anyway, pass this entry to those who may benefit from this little tale of inspiration. It is not a shameless plug. To the skeptics who still think I am. Fine. So long as I can get 1 more person benefit from this little entry of encouragement. So be it. Let me be the shameless plugger. I'll take the bullet for this. 85% of my students are girls which is why they seem always appear in my photos. To prove I do have guys in my classes. Here is the proof. my university is located in a less affluent part of Texas. Many of my students work full-time and go to school full-time. the girl in the picture, anna, works more than 40 hours a week to support herself through college. this afternoon another student came to my office asked me if i could let her do extra credit work to pull up her grades. she works 44 hours a week, mostly night shift at a big chain supermarket. by the time she finishes her work, it's almost two in the morning. she has to be back to school for an 8:00 AM class. how can i blame her for dozing off? October is probably a good time to visit southern Texas. The unbearable scorching summer heat starts to cool down. 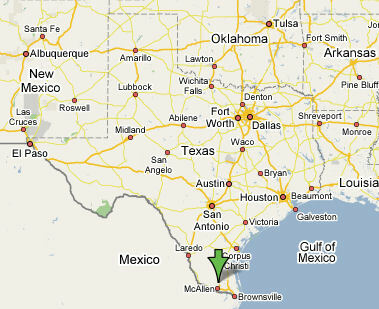 McAllen Airport (Texas) is your final designation. nice.....so many people take their own good lives for granted. Akk: I only hope for my reader/friend to be inspired by this little tale. As and when they feel lost or disheartened juggling work and studies and/or even families, I just hope my way of encouragement would serve its purpose as it was originally intended. hiaoauntie: Speaking of Texans, I am expecting a Texan customer this morning. His cuff links, buttons and lapel pin all got bears the symbol of the Longhorn. True-blue Texas dude and a very nice guy, if I may add. hiaoauntie: I say big size as in big built lah. Not dua kee lah... You are most jialat!! !